True Love Video Slot Review - Casino Answers! 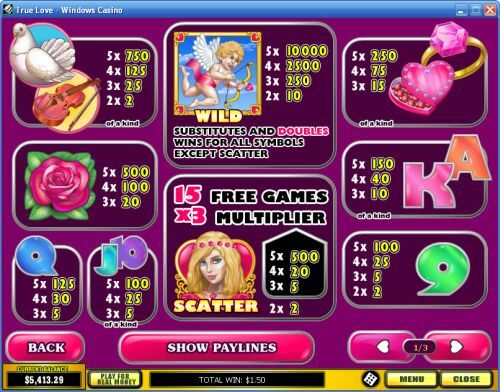 True Love is a 5-reel, 15-line video slot developed by Playtech, featuring a wild symbol, scatter wins, multipliers, a free spins feature and a gamble feature. You can play the True Love video slot at Bovada. Coin values on the True Love slot machine are $0.01, $0.05, $0.10, $0.25, $0.50, $1, $2 and $5. You can select up to 15 paylines and from 1-10 coins per line. The lowest total bet you can make on the True Love video slot is a penny per spin. The highest total bet you can make is $750 per spin. True Love has a fantastic betting rage that is suitable for any casino player – anywhere from casual player to high roller. You can manually skill stop the reels by pressing the “Stop” button in the middle of a spin. To play the True Love online slot, select your bet and press the “Spin” button. To activate all 15 paylines at 10 coins per line, you can also spin the reels with the “Bet Max” button. The highest paying symbol on the True Love video slot is the Cupid symbol. 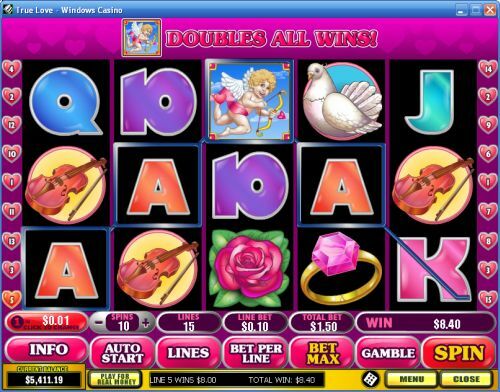 5 Cupid symbols on a selected payline will pay out the 10,000 coin top jackpot. The Cupid symbol is wild and will substitute for all symbols except for the scatter symbol. It will also double your win on any winning combination in appears in. Use this symbol to create new wins and win big at Bovada! The Girl is the scatter symbol on True Love. 5 Girl symbols anywhere on the reels will pay out 500X your total bet. 3 or more Scattered Girl symbols will win you 15 free spins at a 3X multiplier. You can always re-trigger the free spins feature to win 15 more free spins. Whenever you get a win on the True Love slot machine, you can press the “Gamble” button to activate the gamble feature. You will be given the option of risking all of your winnings to double your winnings or only risk half to double half of your winnings. There will be 5 cards laid out. The dealer’s card is on the left. Your goal is to pick a higher card. If you are successful, you will double or double half of your win. If you lose, you will lose the amount of winnings you risked. You can exit the gamble feature and save your winnings by pressing the “Collect” button. You may play up to the double up limit, which is listed in the “Info” section. Above the “Auto Start” button, you can select up to 99 autoplay spins on the True Love slot game. To start the autoplay mode, once you have selected your number of spins, press the “Auto Start” button. To stop the autoplay mode at any time, press the “Stop” button that is under the autoplay counter. True Love is a very well done video slot by Playtech. It is great for Valentine’s Day or any time of the year if you’re just a diehard romantic type. You can play the True Love slot game when you sign up and make a deposit at Bovada! Can USA players play the True Love online slot for real money? No, Playtech online casinos are currently not accepting players from the United States. However, you can play a lot of USA-friendly slots over at Bovada. Can I play a flash game of the True Love free slot in my web browser? No, the True Love flash game is not presently available at Playtech flash-based instant play casinos.